The thick gherkin to the thin one: / You did not get yourself pickled in Heidelberg lager, / therefore, little friend, you are shrunken and done. My mother used to keep this brand of vinegar at our place in the southwestern suburban sprawl of Aalborg. It was mainly used for the washing machine as a replacement for softener, which also meant that the washing didn’t really smell perfumed nor did it really soften the clothing much. Actually, come to think of it, she might have used it against the high “hardness” level of the water, even to protect the washing machine. It’s not for nothing that one of Aalborg’s main old school mining resources is at the cement factory in the eastern outskirts, Aalborg Portland, for which -at it’s periphery- there these days is a watchtower you can climb to admire the scraped off and deeply dug into chalk segments below water level. Either way. 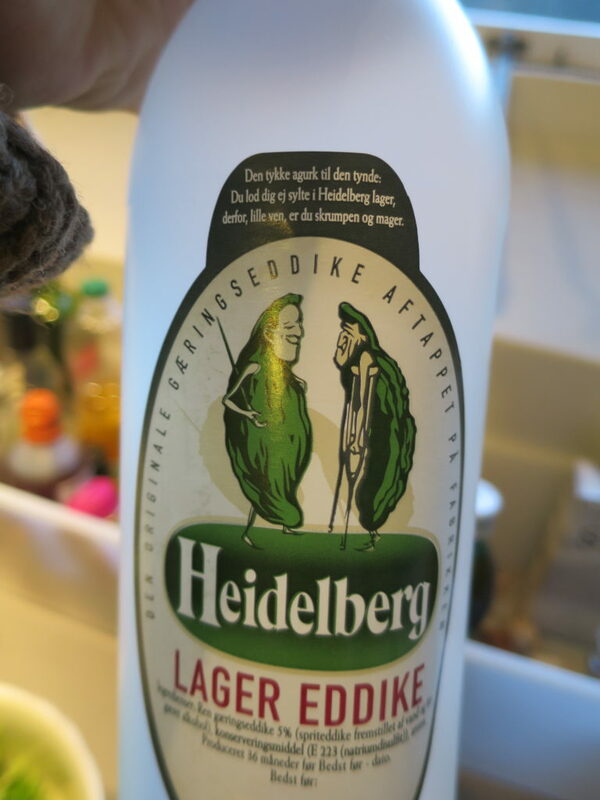 That actually adds an ironic twist to the two gherkins depicted on the label of the Heidelberg Lager Eddike [Vinegar] – to the left, the “healthy” one proudly faces a shrunken gherkin colleague to it’s right. So assuming this vinegar would make for a “healthy”, walking stick swinging gherkin, it would mean that vinegar in this washing machine friendly hardness-softener environment of my childhood actually creates “strength” through softening. That’s gotta be the queering of the vinegar gherkin word of the day. Or a slight reappropriation of tales of up+down, strong+weak, un/healthy centuries-old ingrained binary thought.